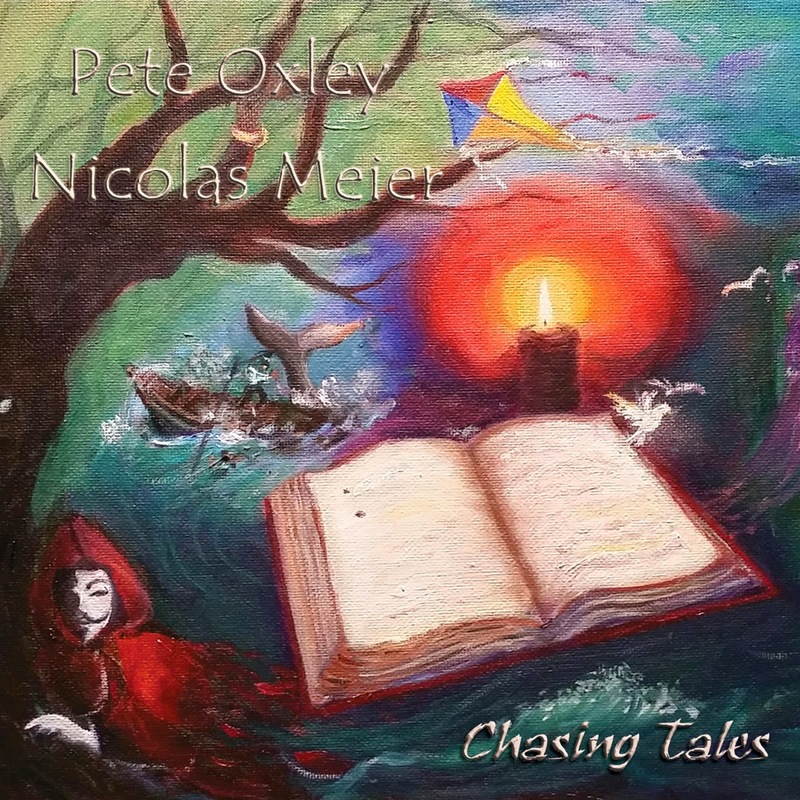 On this rather lovely record, Pete Oxley and Nicolas Meier play a wide range of guitars and other stringed instruments (and some synth - guitar or otherwise - on a couple of tracks. Unlike their previous record together, Travels, Chasing Tales was recorded in the studio, allowing for what sound like some over dubbing on some tracks. Despite that, the record has a very spontaneous, largely optimistic feel to it. It simply makes you smile. It is very enjoyable. Most of the record is acoustic, and it is quite a quiet sound, at times as close to classical as jazz guitar. There are also some folk and world influences, particularly on Uzun Ince Bir Yoldayim, on which Meier plays baglama, a Middle Eastern form of lute. But basically it is two people playing guitars rather well, apparently just for the love of it; its simplicity is appealing. I can't tell Oxley from Meier, especially when they are exchanging licks across choruses on some tracks, though for guitar geeks their contributions to each track - the instruments they play and the order of solos - is detailed. I listened to it six times before writing the review. I listened at different times of the day and in docent environments. I thought it a lovely record - but one which I didn't find a lot to say about, except that iI liked it! I would be very interested to learn what you thought I was missing. It isn't clear whether you feel the music deserved more attention or less. "allowing for what sound like some over dubbing on some tracks": As you pointed out, they list all of the instrumentation inside the sleeve, and seem to have made a definite point about the overlaying! "most of the record is acoustic, and it is quite a quiet sound..." Referring to the above point, some of the overdubbing has led to what I would say is a huge sound (for a 'guitar duo'!). Take 'The Bridge' for example: the foundation is layer down on nylon string and steel string guitars, then there is the melody part played in octaves on Nicolas's amazing-sounding glissentar and slide guitar. The solos also feature some kind of analogue guitar synth right up on top. Also, on Breezin On, Nicolas takes a solo which could be from the best of the 'metal' players! And who knows how many guitars there are on that track! So, it was those comments, plus your talk of its "simplicity" which provoked me to write. Listen to the harmonic complexities in Looking West, or The Bridge, for example: I certainly wouldn't describe this as 'simple'!! No offense intended, it just seemed from what you had written that you had listened to a different album to the one that I have been enjoying! I really appreciate your articulate response - thank you for highlighting aspects that I missed. I think this just goes to prove how we can all find different things in music! You're right to pick up on my use of "simplicity", too: I don't that adequately conveys the meaning I was after, and I spent quite a while trying to find another way of putting it. I concede that I failed! One of the things I feel about writing about CDs (and live music) is that I can only try to explain what I hear and the effect the music has on me. I avoid reading other reviews, concerned I might end up writing their review rather than mine! And clearly, one can't expect everyone to agree!